The coolest technology to come out of Adobe MAX is, sadly, not the technology we already have access to. Like Adobe’s Project Cloak we showed you earlier today, it’s the incredible ‘Sneaks’ sneak peeks that really wow the audience. Case in point: check out Project Deep Fill, a much more powerful, AI-driven version of Content Aware Fill that makes the current tool look like crap… to put it lightly. 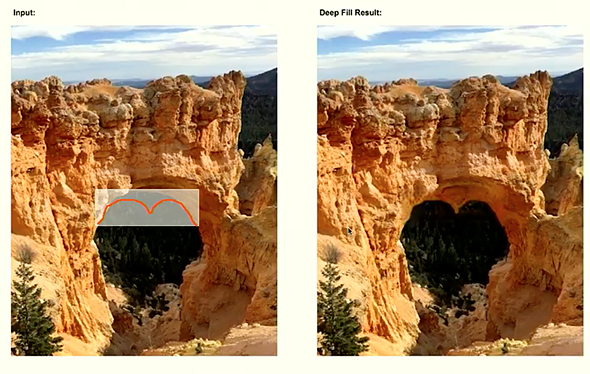 Deep Fill is powered by the Adobe Sensei technology—which “uses artificial intelligence (AI), machine learning and deep learning”—and trained using millions of real-world images. So while Content Aware Fill has to work with the pixels at hand to ‘guess’ what’s behind the object or person you’re trying to remove, Deep Fill can use its training images to much more accurately create filler de novo. In this way it’s a lot more than a ‘fill’ feature. In fact, Adobe calls it “a new deep neural network-based image in-painting system.” Check out the full demo for yourself above, and then read all about the other ‘Sneaks’ presented at Adobe MAX here.